The White House wields the most effective dog whistle in today’s politics. Every ahistorical, nonscientific, or malapropistic utterance evokes a breathless rejoinder from the Media. Each response—like a pundit’s juice cleanse—blends lamentation, pretension, outrage and disbelief. And each response is like a match lit in a gale: a little heat, a bit of light, a wisp of smoke. No doubt, all this barking has its benefits: unfairly maligned adjunct professors Skype their 15 seconds of FameTime, Amazon clears its inventory of boxed sets of Ken Burns’ Civil War, elementary school world atlases are reprinted in biblical numbers. But this dog whistle is truly inadvertent and, what is worse, the drama obscures the deepest dysfunction: we have a Modern President in a Postmodern world. Modern masters: Einstein, Picasso, Joyce and Freud. A century ago, Modernism displaced Realism everywhere: in science, art, psychology, literature. Einstein’s relativity supplanted Newtonian physics. Artistic realism, threatened by photography, surrendered to conceptualism. Freud’s subconscious uprooted phrenology. And in literature, Modernity brought us the stream of consciousness of Ulysses and the alienation of The Hairy Ape. These intellectual flows lapped, overlapped, and influenced each other. Across disciplines, these styles are all of a Modern piece. Late last century, the Modern yielded to the Postmodern. Postmodernism challenged Modern notions of progress and unity. It emphasized competing narratives, shifting identities, pluralistic truths, hidden power. Complexity, ambiguity, and contradiction are central to Postmodern paradigms. We Postmoderns, like Schrödinger’s cat, bear the uncertainty of quantum theory, which Einstein rejected. We are surrounded by abstract art, which Picasso disfavored. Our analysts battle Freud’s ghosts with behavioralist techniques. Our Postmodern literature seethes with irony, self-awareness, detachment. And in our galleries, the high art of balloon dogs and soup cans mocks our consumerism. 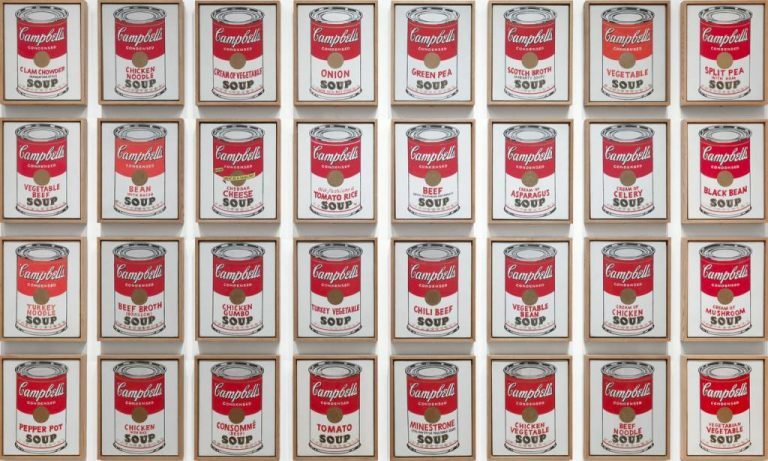 Postmodern master works: Erwin Schrödinger’s cat and Andy Warhol’s Campbells’ Soup Cans. This President is irreversibly Modern. His language is Joycean, his psychology Freudian, his science deterministic. His speech is Cubist. His phrases are jumbled, his ideas jagged shards. They bombard the audience with simultaneous (and often incoherent) perspectives on a single subject. This is Picasso’s Guernica: a jarring, but overall comprehensible image. The image at the top is a replica of Pablo Picasso’s 1937 painting, Guernica, created as a mosaic. This President’s Modernity chafes against today’s intellectual fashion. Radical conservative or progressive liberal, we are all Postmodernists now. We all live in the ideological slipstream of Michel Foucault and Cornel West, Samuel Beckett and Margaret Atwood: from the air we breathe, we are all amateur critical theorists. We smile at Koons and Warhol as they make fun of us. We revel in the ironic self-awareness of mockumentaries and the Orwellian titillation of reality television. The pitch of this President’s Modernity assails most harshly the ears of our most elite. The Media are outraged that the President betrays not a shred of irony in his stark contradictions, not a dose of detachment in his crass commercialism. As the champions of plural truths and keepers of multiple histories, our elites are apoplectic—not at the reference to “alternative facts,” but at its accidental and unstudied invocation. But their sharpest ‘gotchas’ and most footnoted falsifications fizzle: this President streams Modernist monologue, not Postmodern precision, he is The Sound and the Fury, not The Unbearable Lightness of Being. No question, this President’s style is retrograde. But it makes no more sense to parse a Trumpian tweet than to interpret two square inches of Guernica. 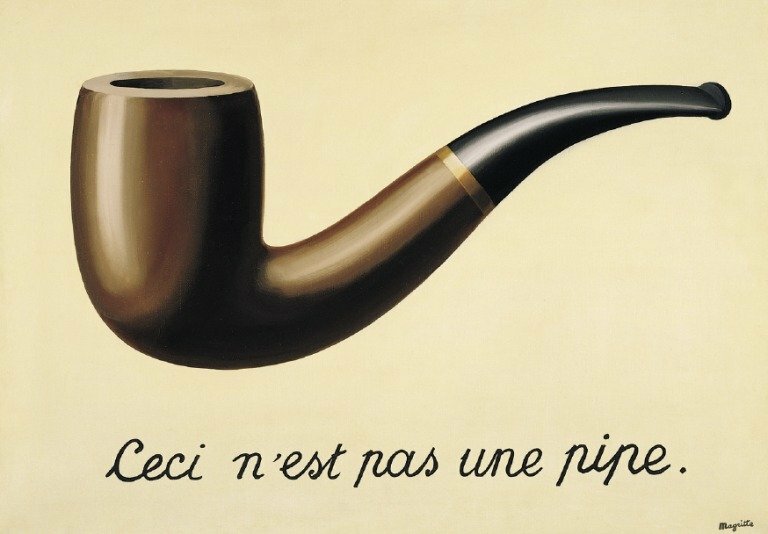 The artistic peak of Postmoderism was early and understated: Magritte’s Treachery of Images is a flawless painting of a pipe captioned “This is not a pipe.” The canvas asks: is a painting of an object the same as the object itself? And what if painting declares that it is not what it appears? What controls—the declaration, the image, or the reality? 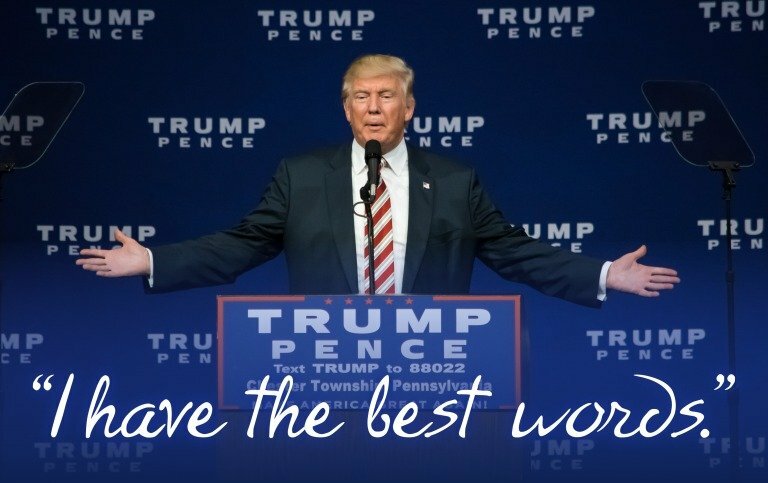 This President asserts: “I have the best words.” As a Modernist, he does not see the irony, the tension, in that scene. What controls—the assertion, the (in)eloquence of the assertion, or the oratorical reality? For the Postmodernist pundit, these are the essential questions; for the Modern President, they are just word clouds floating by. While unforgivable, the President’s anachronism is understandable. Today, we are all lost. What comes after the Postmodern—what follows today’s ironic, skeptical pluralism—is unknown. What becomes of culture, literature, even thought, when nothing is owned (only Uber-ed or Zip-ped); when WordPress makes everyone an author and Wiki makes no one an authority; when Fiverr gives everyone work, but Etsy is hardly a living; when nothing persists, except Watson in The Cloud? And what’s next after we navigate the labyrinth of identity politics and outgrow class economics? What’s Next is the grandest crowd-sourced challenge of our age. This President—and the other atavistic Modernists (Putin, Erdogan, et al. )—are only transitory figures, marginal to that historic quest. The future will be written by our public intellectuals, including the Media. But to do so, they need to stop howling, move beyond the crawler fodder, and return to critical thinking. A replica of Pablo Picasso’s 1937 painting, Guernica, created as a mosaic.